Daniel Mays Fan Website, and its advertisers and affiliates are deeply committed to protecting the privacy of Internet users. Below is information outlining our continued support for the responsible management of consumer information. During the process of delivering an ad to you, Daniel Mays Fan Website does not collect any personally identifiable information about you such as name, address, phone number, or e-mail address. However, Daniel Mays Fan Website does obtain some types of non-personally identifiable information such as the Internet Service Provider you use to connect to the Internet, your browser type, or the type of computer operating system you use (Macintosh or Windows, for example). The information collected by Daniel Mays Fan Website is used for the purpose of targeting ads and measuring ad effectiveness on behalf of our advertisers. If you would like additional information about the types of non-personally identifiable information that is collected by Daniel Mays Fan Website please contact us. In some cases, you may voluntarily provide personal information in response to a specific ad (this ad may ask you to fill out a survey or provide your zip code). If this does occur, Daniel Mays Fan Website may collect this information on behalf of an advertiser. This information is used by an advertiser to respond to your request. In addition, Daniel Mays Fan Website may combine this information with other users information and review it in an aggregate form to understand the type of individuals who view a specific type of ad or visit a particular kind of website. Daniel Mays Fan Website use anonymous identifiers (cookies) to collect anonymous preference and interest information. This information is provided by Daniel Mays Fan Website and is used by Daniel Mays Fan Website to create anonymous interest profiles on individual browsers. This information does not include any personally identifiable data (such as name, address or e-mail address) that is considered sensitive or controversial or would compromise a consumer’s privacy. Daniel Mays Fan Website profiles are accessed by Daniel Mays Fan Website to tailor site content, promotions and advertising, and to perform market research. Daniel Mays Fan Website allows consumers to opt-out from these profiles at any time. 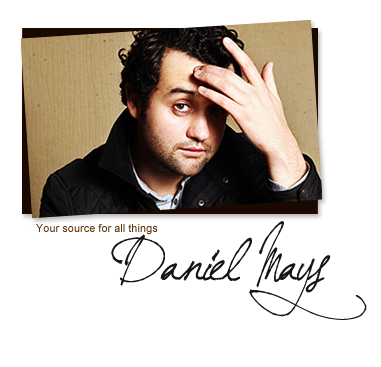 Daniel Mays Fan Website, as well as most sites on the Internet, uses “cookies” to enhance your experience on the web. Daniel Mays Fan Website cannot use these cookies to personally identify you in any way. What are cookies and why do we use them? A cookie is a unique number that is provided to you the first time Daniel Mays Fan Website serves you an ad. This unique number, which is stored in a cookie file on your computer, helps Daniel Mays Fan Website target ads to you. This cookie can help Daniel Mays Fan Website ensure that we don’t serve you the same ad multiple times, and help our advertisers understand what you like and don’t like about their offerings so that they can cater better to your needs the next time you are interested in their products or services. While we believe that cookies enhance your Internet experience by limiting the number of times you see the same ad and delivering more relevant content to you, they are not required for Daniel Mays Fan Website to deliver you an ad. If you do not want the benefit of cookies, there is a simple procedure to manually delete your cookies. Please consult your web browser’s Help documentation for more information. If you would like to “opt out,” that is, to prevent any data from being stored by Daniel Mays Fan Website, please contact us. If you have any additional questions about Daniel Mays Fan Website’s dedication to consumer privacy, please contact us.